Water represents one of the biggest opportunities for savings in your home, and one of the best places to start is in your shower. According to the Environmental Protection Agency (EPA), the average american uses 100 gallons of water per day! With nearly a quarter of that being used in the shower alone. By installing a shower flow valve adapter you can reduce not only the amount of water you use, but you can save on your energy bill as well. Every gallon of water used in your shower taxes both your water and electric bill since the water needs to be heated. By reducing the amount of water you use during your shower, you’ll save on both bills and prevent CO2 emissions from being created. Just follow these easy steps to start saving on your bills today. 1. Remove your shower head. In most cases the shower head should come off easily. Simply rotate the shower head to the left to loosen it. 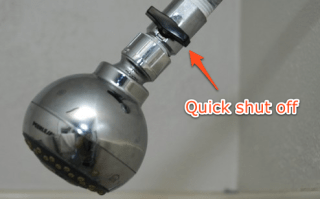 If your shower head doesn’t move, you might need to take the wrench and give it a slight turn to get it started. Once it’s loosed, continue turning it until the shower head comes off. 2. Place teflon tape onto the threaded end of the water line. Take your teflon tape and put a thin layer around the threads on the end of the water line. This will help the shower flow valve adapter attach more securely and prevent water leaks while the shower is in use. Once you’ve covered all the threads, cut off any excess tape and make sure you’ve got a snug fit. 3. Attach the shower flow valve adapter. Simply take the shower flow valve adapter and screw it onto the grooved end of the water line. Remember, turn it to the right to tighten it. It doesn’t need to be much more than finger tight, so give it a slight turn with the wrench to make sure it’s attached firmly. 4. Cover the male end of the shower flow valve adapter with teflon tape. Repeat the same process as before and apply a thin layer to the threaded male end of the flow valve adapter. This will help to ensure a good fit between it and the shower head. 5. Attach the shower head to the shower flow valve adapter. Now take the shower head and screw it onto the threaded end of the flow valve adapter. Again, this only needs to be a little more than finger tight, so take your wrench and give the shower head a slight turn to attach it securely. 6. Turn on your shower and test the valve adapter. Simply turn on your shower as you normally would and watch to see if you have any leaks coming from either the valve adapter or shower head. If you do have a leak(s), turn off the water and use your wrench to snug up the fit. If you’re water is flowing properly, go ahead and turn the shut off valve to the off position. If installed properly, the water should stop flowing out of your shower head. Now, go ahead and turn it back to the on position and turn off your shower. Now that you’ve got your new shower flow valve adapter installed and working you’re ready to start saving both water and energy! Every time you’re in the shower, use the valve adapter to shut off the flow of water while your applying soap to your hair or body. Once you’re done applying soap, simply reach up and turn the valve back on to rinse off. By eliminating the flow of water while you soap up you’ll use less water and energy. After all, every gallon saved will add up to big savings in the end! If your curious about more ways to save water in your home, check out this article featuring our top 5 toilet water saving devices. Or try this article featuring indoor and outdoor water saving tips. Also, be sure to check out some of our green home improvement projects: Green Living Ideas, after all, is a top 20 home improvement website! Photo courtesy of Life Hacker.